Since the earliest days of U.S. legal history, women have sought legal redress for statements about their sexual behavior or otherwise about them as sexual beings. These female plaintiffs have typically employed defamation law to sue on the basis of communications that undermined their reputations for sexual propriety, which the law referred to as chastity. 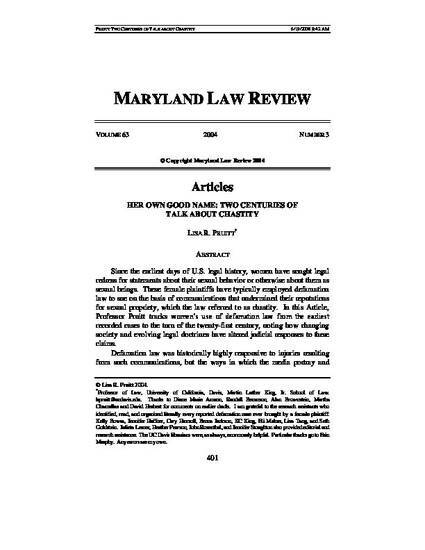 In this Article, Professor Pruitt tracks women’s use of defamation law from the earliest recorded cases to the turn of the twenty-first century, noting how changing society and evolving legal doctrines have altered judicial responses to these claims. Defamation law was historically highly responsive to injuries resulting from such communications, but the ways in which the media portray and undermine women are constantly shifting. Professor Pruitt focuses in particular on late twentieth century defamation cases related to chastity and sexual portrayals. She observes that courts still recognize injury to a woman’s reputation from a straightforward assertion of adultery, prostitution, or certain sexually “deviant” behaviors. Contemporary defamation fails, however, to acknowledge or provide redress for many other statements that ridicule and demean women in relation to their sexuality. Professor Pruitt’s analysis illustrates how constitutional doctrines associated with defamation law, such as the fact-opinion dichotomy and the related protection of rhetorical hyperbole, defeat women’s legal claims and obscure the dignitary injuries they suffer. As a solution to this legal oversight, Professor Pruitt argues for recognition of a new tort for technically false statements that demean or ridicule. She explains how such a tort is consistent with first amendment jurisprudence, and she discusses how it is preferable to defamation law in terms of its candid characterization of injury as one to dignity, rather than to reputation. While she acknowledges that her proposed solution is not foolproof (and risks continuing legal regulation of women’s sexuality), Professor Pruitt argues that it is nevertheless preferable to provide a remedy that women may invoke rather than to leave them entirely without the option of legal redress.